After the events of Civil War: Infinity War, Prince T’Challa returns to his home country of Wakanda in order to take his late father’s place as king. Once there, he must confront the sins of his father and ancestors in order to determine his country’s place in the world. There’s a lot of good things to say about this movie, so before I dive in on that I do want to briefly touch on the one glaring issue that I have with this movie, and that I am finding that I have with a lot of the movies in the Marvel Cinematic Universe (and it is not the villain). For whatever reason, the primary visual effects in these movies have been pretty severely lacking, and that is the case here. Whether it is large crowds that become increasingly fake looking the further away from the focal point of the scene, attack rhinos, or when the Black Panther costumes are seen from a distance against a CGI background, there are times in this visual effects-driven movie where the visual effects are clearly computer-generated. There are other times when the effects do work (the gorgeous sky in the land of the Wakandan dead [below image] is a striking image created by the VFX team, and enhanced by the lights captured by Academy Award-nominated cinematographer Rachel Morrison), but, in general, the effects are lacking. I gave Justice League a hard time about this just a few months ago, and it is only fair that I call it out in the MCU for the same issue. That’s really the only area that this movie stoops down to the level of a film from the DC Extended Universe. Not only does this film feel nothing like one of the movies in that inferior franchise, but it also rises above many, if not all, of the films in its own universe. The story and direction brought by writer/director Ryan Coogler (of Fruitvale Station and Creed fame) both stand out in an overall enjoyable franchise and is able to work with his cast in order to create the best top-to-bottom performances in this universe. I could praise each member of this cast. Chadwick Boseman returns to the role of T’Challa after his scene-stealing debut in Civil War, and he leads this film with a confident regality. 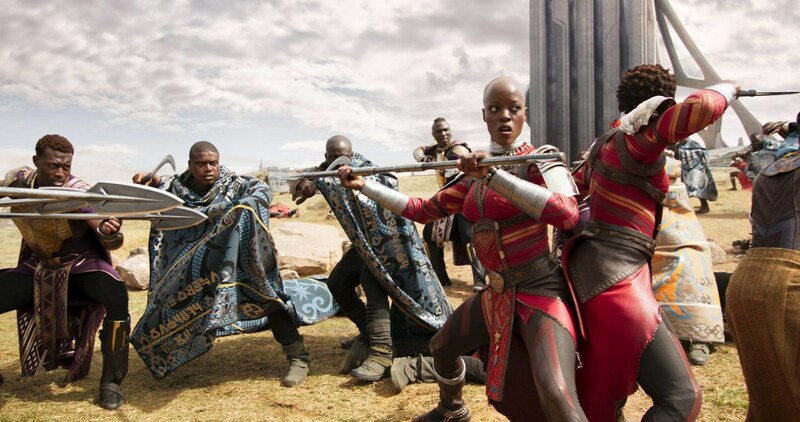 The Walking Dead standout Danai Gurira leads the entirely female royal security team, the Dora Milaje, with scene-stealing moments on top of a speeding car and on a Wakanda battlefield. Relative newcomer Letitia Wright is an absolute joy as T’Challa’s brilliant younger sister, Shuri (canonically the smartest person in the MCU, surpassing even Tony Stark and Bruce Banner). Andy Serkis steps out of the performance capture suit for a rare live-action performance as the entertainingly scene-chewy villain Ulysses Klaue. However, the film’s most impressive performance goes to frequent Coogler-collaborator Michael B. Jordan’s villain, a role that the MCU has famously had issues with in the past. As Erik Stevens, Jordan brings an impressive rage to his performance, looking for revenge after his father was so easily cast aside three decades prior. It’s rare that a villain brings a film’s most emotional moments, but two of Jordan’s scenes are the most heart-wrenching in the film, as he confronts not only the loss of his father but the dissonance between the life he grew up with in Oakland to the eutopic homeland that Wakanda could have offered him. The performance is excellent, but credit should be given to Coogler’s script as well. Stevens’ motivation is generally in the right place. Wakanda is an amazingly scientific country, with incredible technology that makes it possible to drive a vehicle from a remote location and weapons that can send an electronic pulse powerful enough to stop a tank, but their isolationist past has made it impossible for impoverished nations to overthrow their captors. Stevens wants to bring that isolationism to an end so that other Africans around the world can throw off their shackles, whether literal or metaphorical, but is willing to take away potentially innocent lives along the way, which is really why T’Challa must do what he can to stop him. With a grounded motive and an impeccable performance, Erik Stevens and Michael B. Jordan not only launch themselves to the top of the list of MCU villains (edging out Daniel Bruhl’s similarly grounded and well-performed Zemo) but put themselves in the top tier of all comic book villains. This movie is a technical masterpiece as well (outside of the disappointing visual effects). As mentioned above, newly minted Academy Award nominee Rachel Morrison (the first female cinematographer to ever receive that honor) creates some gorgeous shots in this movie, including the panther tree in the land of Wakandan ancestors and a striking shot of Jordan standing amongst a burning garden. Ryan Coogler mainstays Hannah Beachler (production design) and Ludwig Goransson (composer) both impress as well, with Beachler’s design of Shuri’s lab giving us an idea of how brilliant T’Challa’s sister truly is and Goransson’s tribal score giving the music an added level of depth that this franchise does not typically include. Costume designer Ruth E. Carter’s research into African tribes allows for an essential authenticity to the Wakandan garb. Coogler’s cast and crew are able to create a superhero film that feels so realistic that it rarely feels like a superhero film (with the exception of the film’s major action sequences which, admittedly, are still hugely entertaining to watch), and this world cluttered with superhero films, that’s a wonderful gift. This film is already, in its first weekend, a massive and unprecedented success. There is a lot that goes into something like this: the power of having Disney market your film, being a piece of a major and successful superhero franchise, hugely positive reviews from highly respected critics. But, all of these ignore what is likely the biggest reason this film has been met with so much success. Since the beginning of 2008, the year the MCU began, there have been 17-films in the MCU, five in the DCEU, three non-DCEU based on DC heroes, seven X-Men movies, and two non-MCU Spider-man movies. In that span, there was one movie centered on a black hero, Will Smith’s anti-hero, Hancock, marking this as the first time a black superhero has been the focus of a film in a decade. Not only that, but this is arguably the first ever black superhero movie that is meant for a wide audience. Before that, the R-Rated Blade trilogy was obviously only meant for adults, and Spawn and the previously mentioned Hancock were more anti-heroes than true heroes (and the less that is said about Shaq’s Steel, the better), and none of these movies were really made in the superhero boom. Additionally, not only is the film’s lead black, this is a deeply African film; the filmmakers, most of the cast (Martin Freeman and Andy Serkis acting as the Tolkien white guys for this film), and the film’s overall story and heart are all unapologetically black. This movie is unlike anything else that has been released before in that respect, let alone in what will easily be one of the year’s biggest releases. Already, videoes of black children excitedly pointing at the poster for this film, seeing people who look like them advertised in a major way, are creeping up online. Not only that but pictures of kids and adults going to a theater, dressed in traditional African garb or cosplaying as T’Challa or the Dora Milaje, were all over Twitter in the film’s opening weekend. Representation matters. It’s past time we recognize that. It’s time we demand that. Next Article Is Erik Stevens The Best Antagonist in the Marvel Cinematic Universe?